The Radisson Salt Lake City Downtown is surrounded by the Wasatch Mountains. Located adjacent to the Salt Palace Convention Center and across the street from the Energy Solutions Arena. Just a short walk to City Creek Shopping Center, the Gateway Open-Air Shopping Center, Historic Temple Square, Symphony Hall, Capitol Theater, popular dining, entertainment and nightlife options. Completed $5.5 million dollar renovation in 2012. 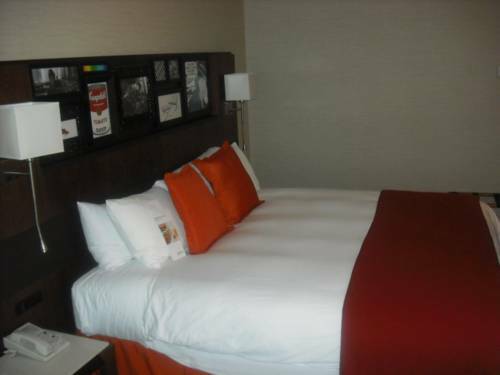 Hotel amenities include concierge, laundry/dry cleaning, 24-hour front desk, room service, and business center. Guests may also enjoy the indoor pool and exercise facility. Onsite drink and dining options include the Copper Canyon Grill House & Tavern. All rooms feature complimentary wireless high-speed Internet access. Copper Canyon Grill House and Tavern: Located off the lobby. Wasatch Ballroom: 15,000 square feet of meeting space with 17 breakout options available. Ballroom is 5,600 square feet. Salt Palace Convention CenterWhether you're visiting for a trade show or a corporate event, this state-of-the-art venue is a great place to meet. The convention center is conveniently located adjacent to the Radisson Hotel Salt Lake City Downtown. Family History LibraryOffering genealogy research resources at no charge to the public, this library is housed in a five-story building and was established in 1894. University of UtahThe University of Utah offers world-class educational opportunities in a wide variety of majors and concentrations. Mormon Tabernacle ChoirWorld famous choir. Made up of hundreds of volunteers from all walks of life, this unique music organization transcends cultural and generational boundaries and brings together people from around the world through stirring music. Hogle ZooWildly popular and filled with wild things, Hogle Zoo is a family-friendly attraction that features hundreds of exotic creatures in re-creations of their native environments. Capitol TheaterThis historic landmark hosts major cultural presentations year-round. City Creek Shopping CenterGet lost in this picturesque shopping village, where a creek runs throughout the property and a retractable glass roof and a pedestrian skybridge give shoppers a sense of being in the great outdoors. Joseph Smith Memorial BuildingPreviously known as the Hotel Utah, this stately architectural beauty was built in 1911 and restored in 1993. The tradition of excellent hospitality continues today as tour guides take guests through the white-glazed terracotta and brick structure. Lagoon Amusement ParkRide roller coasters and other thrilling attractions at this popular local amusement park. Temple SquareCovering more than 35 acres, Temple Square is home to award-winning shopping, dining and entertainment options.